Event sponsorship is a chip on the shoulders of numerous meeting planners, who often say: “I wish my sponsors would do more to spread the word about my event.” You know it’s in their best interests, so why aren’t they? The reality is that while they may publish a press release announcing new hires, and schedule media appearances to announce their product launches, events usually come as an afterthought. Justin Post from Map Your Show thinks that in most cases, sponsors aren’t sure what to do or even where to start. “The individuals that ultimately sign-off on an event sponsorship sale (CEO, for example) don’t necessarily specialize in how to also promote the event. They might write the check and assume that’s their best form of promotion,” he says. But it doesn’t have to be this way! There are plenty of golden opportunities for your sponsors to become potent marketing partners; it just takes effort. Signing the event sponsorship deal is just the first step in your relationship. Read on to peek into the minds of sponsors and discover the obstacles they are facing in helping you market your event. The fundamental flaw in the average sponsor-event relationship is the entitlement felt on behalf of sponsors, who are paying you for the exposure your event will bring them. Asking to provide additional resources in the form of event promotion does not fit into the equation. However, this perceived imbalance is actually non-existent. 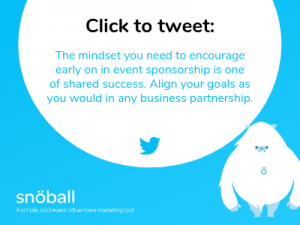 The mindset you need to encourage early on in event sponsorship is one of shared success. Align your goals as you would in any business partnership because both parties truly are in it together. When all event influencers are working together for the good of the event, all parties will emerge having benefited. Event sponsorship alone will not put butts in seats. The legwork involved with promoting an event is considerable, and many sponsors will not have the time to create and execute an integrated campaign on their own. You need to make it easy for them to use their incredible networks by providing them with customized, turnkey content such as graphics, press releases, eblasts, and more that takes away some of the heavy lifting. “Event teams should give them a nicely packaged suggestion on how to help promote the event,” says Justin Post. To save you time in this process, consider giving snöball a try. The unique assets it provides, including branded landing pages with lead-generating capabilities, make this an efficient and powerful solution that sponsors will have no issues using and promoting. A sticking point at the heart of the typical event-sponsor relationship is that the focus is more on a sponsor’s monetary contribution than on their mission and core values. This is a shame because sponsors and events virtually always share common goals, whether they relate to corporate social responsibility initiatives, the spreading of knowledge, the promotion of innovative science, or another raison d’être. These should never be overlooked in favor of the pervasive yet hollow “platinum, gold, silver” event sponsorship designations, but in too many instances they are. The solution to this is to take a closer look at your sponsors to know what they stand for, and tailor your promotional offerings to their company values. 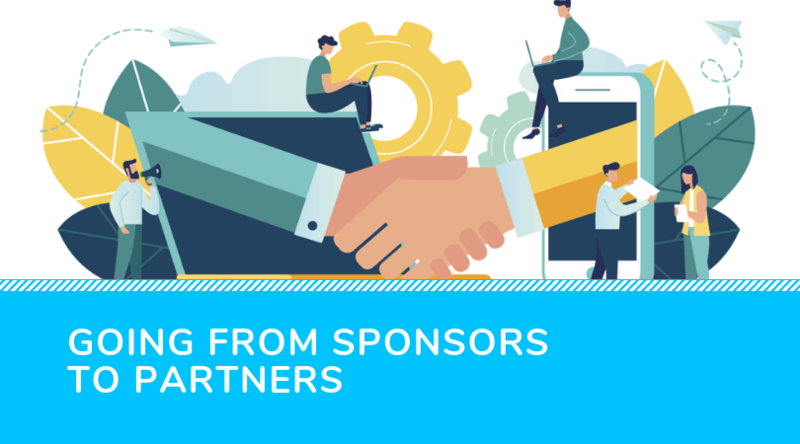 Move away from the tired sponsorship packages and start to build a deeper and more meaningful relationship with sponsors that showcases their uniqueness in the industry. Event organizers should ask themselves why they are proud to have secured a particular sponsor, and use the answer to position sponsors more meaningfully in their events. Sometimes a simple change in verbiage can go a long way towards sponsors embracing your event’s promotion. While the previous point was more general, this is more topical: as you offer them customized marketing materials, try and figure out how you can have them mesh more organically with their current campaign. Refer to their branding or design rules and make every effort not to clash with their existing marketing. This will make it much easier for sponsors to promote your event. A little competition never hurt anyone! Gamification can serve to motivate sponsors into action. Allow them to unlock sponsorship discounts or free tier upgrades/add-ons in exchange for their continued promotion of your event. You can decide which channels or level of frequency will count towards this, or go about it based on engagement earned. A video contest is another fun idea you can try. Ask all of your sponsors to create a short video promoting the value of your event that you will promote on your channels. The best video, as decided by event organizers or fans, will unlock special benefits for that sponsor. Incentives like this inject a fun spirit of competition among sponsors who all stand to gain a little more notoriety among the community simply by participating in them. It’s in the best interest of sponsors to take action in the promotion of their participation at your event; cutting the check is only step one. To streamline this process, make it easy for them to do this, have their interests and goals in mind, and personalize your relationship with them through fun, customized offerings. Learn how to grow your event with the attendee acquisition strategy you’re not using. Does your Event Landing Page have these 5 KEY elements? ©2019 snöball, event influencer marketing. All rights reserved.